Just before mid-day on Monday 24 April, Patrick Pearse stood at the front of the GPO and read the Proclamation declaring the Irish Republic. The rebels entered the building and began barricading the doors and windows, and smaller garrisons took their positions in outposts around Sackville Street such as the Metropole and Imperial Hotels, and shops such as Kelly’s and Hopkins. Shortly afterwards, the looting in Dublin’s main street began. 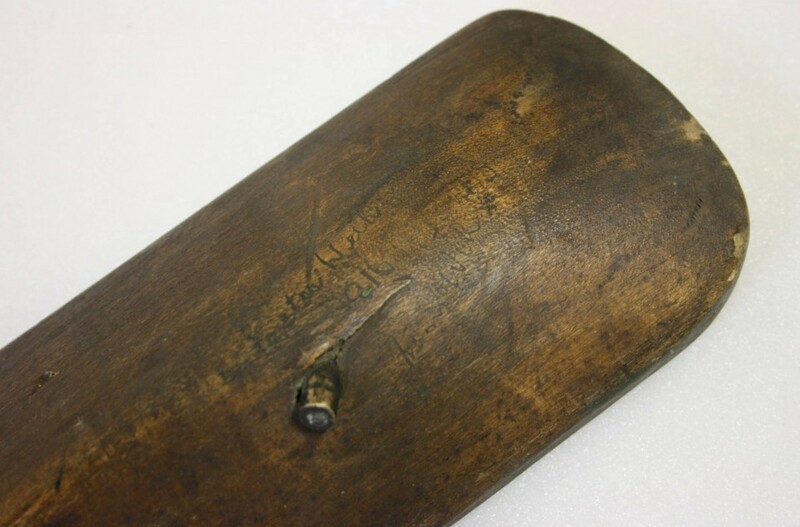 This 7 inch long toffee axe, more than likely taken from a confectioner’s shop, was kept as a souvenir by a Mr Daly after it was thrown at him, hitting his hat, by a looter in Sackville Street during the week of the Rising. It was given to the National Museum in 1980. At almost the same moment as the Proclamation was being read, DMP Constable James O’Brien was shot dead by the rebels in Dublin Castle Yard, and Constable Michael Lahiff was shot at St. Stephen’s Green. Immediately after these incidents the Dublin Metropolitan Police were withdrawn and ordered to their barracks. Being an unarmed force, they would have been targets for the rebels and, with only their standard issue wooden batons, they would have had no way to defend themselves against the rebels’ rifles. This left the streets without its normal law enforcement at a time when the city was descending into chaos. Still, despite the order for the DMP to return to their barracks, the arrests of at least 27 people were made. Most of the looting took place in the first three days, amid the crossfire between the rebels and the British Army Regiments, but before the fires took firm hold in the central streets. Lower Sackville Street was a focal point, with clothes, toy and sports shops proving popular. Noblett’s and Lemon’s confectioners shops were looted for chocolates and sweets; the toffee axe may have come from one of these. The Cable Shoe Company (pictured) had its windows smashed, and The Daily Mail reported that people were seen trying on boots and shoes, and returning for another pair if the first selection failed to fit correctly. Lawrence’s Photographic and toy emporium was also cleared of its contents. Fireworks were taken, and The Irish Times described the scene – ‘Rockets rushed up in the air and burst with a sound like a cannon, and all the smaller sorts of fireworks were thrown whizzing about among the crowd. Finally the premises were set on fire and burned to the ground’. Efforts were made by other citizens to stop the activity. On Monday Francis Sheehy Skeffington, known to be opposed to the use of physical force, made efforts to prevent the looting in the city by personally appealing to the people. The next evening he called a meeting at Westmoreland Chambers with the same aim. It was after this meeting, as he was returning home, that he was arrested and brought to Portobello Barracks, where he was shot on the orders of Colonel Bowen Colthurst. Pearse himself issued a proclamation from the Provisional Government to the Citizens of Dublin, at one point condemning the behavior with the lines ‘The Provisional Government hopes that its supporters – which means the vast bulk of the people of Dublin – will preserve order and self-restraint. Such looting as has already occurred has been done by hangers-on of the British Army. Ireland must keep her new honour unsmirched’. Although the reports focus mainly on the shops in the Sackville Street area which sold luxury items, looting was also happening when the opportunity arose in other areas where the rebels had taken position. For example, it was recorded that after the rebels surrendered their position in Jacob’s Factory, the crowd looted the building on an ‘extensive scale’, taking flour and biscuits. The citizens of Dublin, many of whom lived in extreme poverty, took not only the luxury items they could never afford, but also the basic foodstuffs they needed. This need was also seen in the aftermath of the Rising; where people, including children, searched the still smoking wreckage of buildings for anything they could use, and took the wood from the rebels’ street barricades for their fires. Now that the trouble is all over it is permissible to forget the deplorable and dwell a moment on the ludicrous. Ireland always smiles through her tears. If it were not for the Sackville Street holocaust and for the long casualty list one would regard the happenings of last week as a weird and bad extravaganza, with Dublin beating Sir W.S. Gilbert’s Titipu to a frazzle. To tell the truth, a large section of people hardly knows whether to be mirthful or melancholy about it even yet. Some visitors yesterday were becoming lugubrious over the ruins and the losses when one of them directed the attention of his companions to a hoarding opposite. There in a big type they read this: ‘All Easter Week, The Christian’. Condolences dissolved in convulsions. Every second man one meets has quaint stories of the looting to tell. One relates to a man who, having taken a haul from a hosier’s window, was seen coming back. A second looter expostulated to him, suggesting that surely he had got his share, and it was somebody else’s turn. ‘That’s all right’ said the man addressed. ‘But I’m going to change one of these shirts. I want that one over there with the blue spots’. A priest, meeting one of his Sunday scholars, said cheerily ‘Well, my little maid, and what do you think of “Ireland A Nation”? The child paused, as though mentally balancing the family’s gains and losses. ‘I dunno’, she replied slowly. ‘Mother’s got a new fur coat, but father’s got a bullet in the ankle’. This entry was posted in 1916 Rising and tagged 1916 Rising, Children, Dublin, Easter Week, O'Connell Street, Royal Irish Constabulary, Sackville Street, Souvenirs, Women. Bookmark the permalink. James Crawford O’Neill, a member of the National Library of Ireland staff, died of wounds received, apparently shot in the spine by a looter on the Tuesday of the Rising.